Gloria Allen, Hemlata Jhaveri, Jonathan Gonzales, Sarah Webb, Sharon McMullen, Lee Walter and Philemon Brown, DHFS, completed the 25 hours of Leadership Credits required to graduate from the inaugural DHFS Leadership Institute. 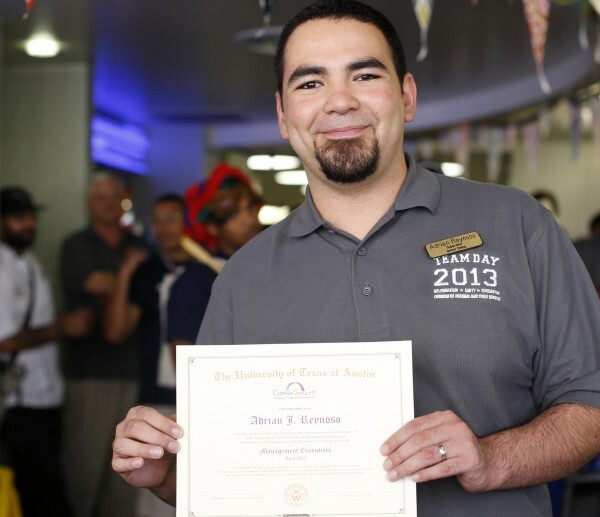 Brooke Bulow, Office of the Vice President for Student Affairs; Rosy Rosales, University Unions; and a member of the DHFS staff who chooses not to be identified, all received Excellence Awards from The Eyes of Texas in May. 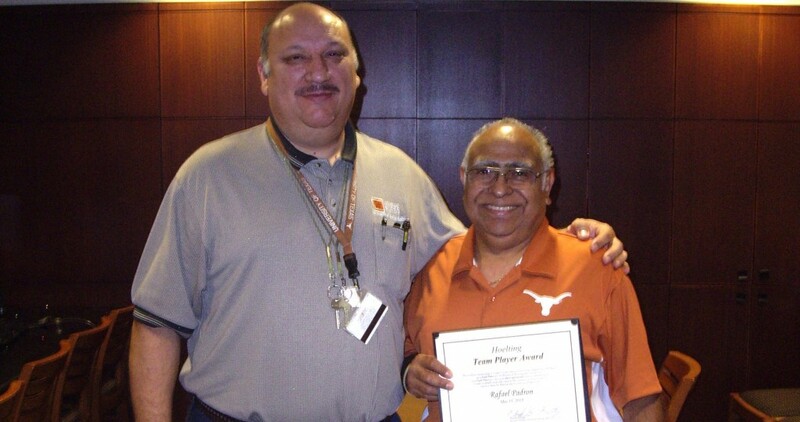 Paula Diaz, Donald Jackson and Adrian Reynoso, DHFS, have completed Management Essentials. 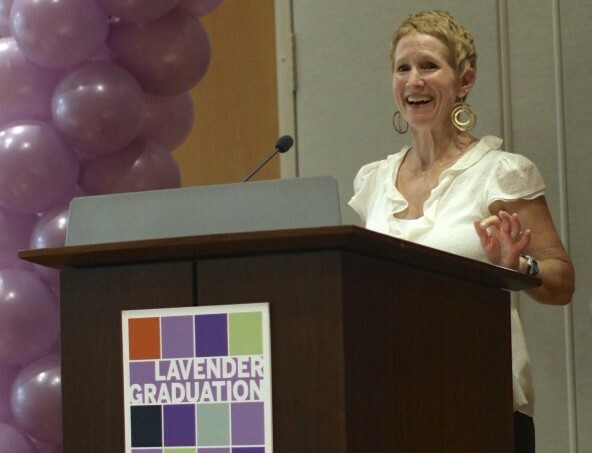 Lynn Hoare, Counseling and Mental Health Center, was presented with the 2013 AIR Award at Lavender Graduation. In 2008 a group of students created the AIR Award to honor Ana Ixchel Rosal, the director of the Gender and Sexuality Center, in acknowledgment of her work improving the lives of Lesbian, Gay, Bisexual, Transgender and Questioning (LGBTQ) students on campus. Susan Hochman, University Health Services (UHS), completed her term as chair of the Health Promotion Section of the American College Health Association (ACHA) and began her year as chair of the 2014 ACHA Annual Meeting Program Planning Committee. Six UHS staff members presented sessions at the American College Health Association 2013 Annual Meeting in Boston. Dr. Theresa Spalding, Robert Reed and Sherry Guyton presented on integrating IT in clinical practice. Susan Hochman, Jessica Hughes Wagner and Jamie Shutter presented on developing and implementing a public information team and strategic communication plan. The Sutures from UHS prevailed as the division softball champions on May 7, defeating the International Office Globallers 12-1 in the final game of the season. Thanks to everyone who came out to play and cheer. With this victory, the Sutures reclaimed the Dr. Vick trophy from the Globallers. 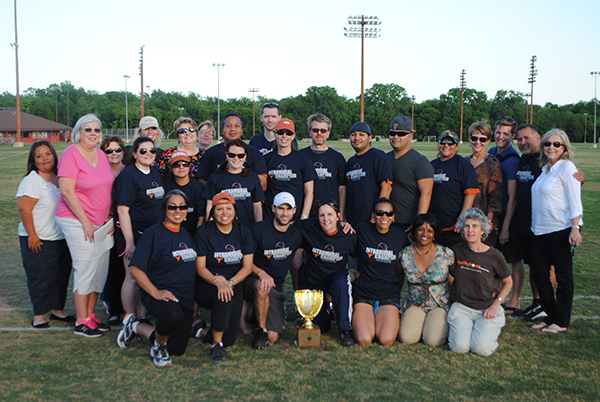 Geek in the Heart of Texas, the team from the Office of the Dean of Students, won the Student Affairs challenge for Most Spirited Department at the RecSports Poker Walk.